If you’re looking to add a cardio component to your workout, consider High Knees. Great for runners, walkers and those looking for fast calorie burning, high knees provide a challenging and energizing interval option. Begin standing. Lift your right knee straight up, adding a hop to the top of the range of motion if desired. Immediately return your right foot to the floor, and lift your left knee straight up, adding a hop to the top of the range of motion. Begin with a ten second interval and build from there. This exercise is for intermediate or advanced exercisers, without injury or illness concerns. 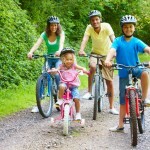 Consider riding bikes for fun as a family. Pick up a bike map at your local bike shop, sit around the kitchen table together and plan a route for a group pedal. Kids in the middle. Riding with one adult in front and one adult behind is a way to make sure everyone stays safe and with the group. Buddy-up. The buddy system still exists because it works. For big groups, each rider should choose another to keep an eye on. Focus forward. Reminding kids to focus their eyes forward at all times will insure they see obstacles in the road such as acorns, bumps in the road, tree branches and the like. Shout it out. When riding with others, communicating about upcoming obstacles or changing direction is nice habit to put in place. For example, simply pointing at the ground as you’re riding by a hazard on the bike path will alert those behind you to something in the road they should be aware of. Keep it steady. Riding at an even pace adds fitness benefits, but more importantly allows those around you to anticipate your moves. Darting in and out of traffic or speeding up and then randomly stopping creates a hazard to those around or behind you. Yield to cars. Just because a cyclist legally has the right of way, doesn’t mean the driver sees them. Always assuming the driver does not see you, is a great rule. When in doubt, simply teach your kids to pull to the side of the road, stop and wait for the car, other cyclist, pedestrian, etc to pass. Pass on the left only. Slower riders should always ride on the right side of the bike path or road, allowing other riders to pass you on the left. Be seen. Insist every rider wear visible clothing. Choose bright colors, reflectors or even a flashing light that attaches to the seat post is a great idea to insure visibility to cars, other riders and pedestrians. 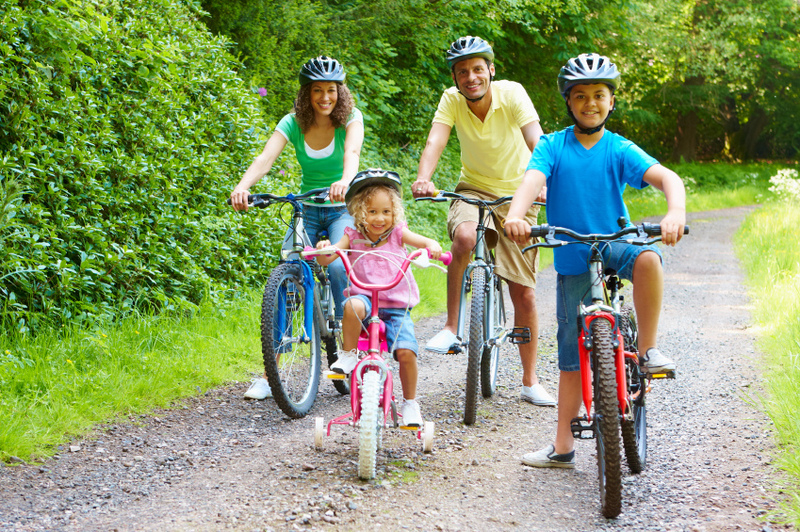 Ride for fun and boost fitness for the whole family. No mileage or speed requirements. Stop and smell the flowers or check out an interesting sight along the way. Pack a lunch or snacks and sit and relax at your destination for awhile. Just go!